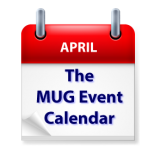 A truly star-studded week lies ahead on this week’s MUG Event Calendar, with appearances by Apple’s Dave Marra in New York, iMore’s Rene Ritchie in Colorado, and Mac Geek Gab’s Dave Hamilton in New Jersey. Adam Christianson of The MacCast will address a California group, while Macstock’s Mike Potter will visit a Wisconsin group. Other topics on this week’s agenda include USB, cybersecurity, AppleNews+, graphics on the cheap, and more. New Hampshire Seacoast Mac User Group – Can You Finder? Suburban Chicago Apple Users – Dave Hamilton presents How Could Mesh Networking Improve Your Life?